Is kayaking on your bucket list? Have you ever wanted to try it? Paddle sports are on the rise according to paddle sport statistics and kayaking is the most popular form of paddling. Kayaking allows you to experience new things and have your own unique experience with nature. Being only a few inches off the water and a few feet away from wildlife, you gain a new connection and understanding of the natural world around you. Kayaking is a recreational activity that is fun for all ages. Escape the daily grind, leave the phones and tablets behind and join us for a kayak lesson. Learn about kayaks, paddles, apparel and how to be safe on the water. We’ll start our journey by launching off the EZ Dock Launcher, where you just put your kayak (which we supply) down on the rollers and roll off into the water. As soon as you’re floating on the water, chances are you will float right into a patch of fragrant water lilies, which are scattered all throughout the lagoon. Along with the aquatic plants, there is an abundance of wildlife. You can witness Great Blue Herons wading in the shallow waters or flying overhead, while common terns are diving next to you trying to catch their next meal! In the lagoon, we have an Osprey nesting platform. From our kayaks below we have had the pleasure of seeing the parent birds keeping watch over their chicks. Swimming right below our kayaks is a diverse group of aquatic life such as fish and turtles, while flying around us are dragonflies and damselflies. Our evening kayak classes are often accompanied by the ever telling song of the bull frog, singing along with the cicadas which are heard all throughout the park on any given summer day. Getting out on the water with us can give you a chance to see all of this; but also give you a new understanding of kayaking as a sport, learn more efficient ways of paddling, and a few tricks of the trade. So what are you waiting for? Find a kayak class near you and see where your next adventure will take you. We are here. Where are you? There’s no time like the present to incorporate a new tradition into your holiday celebration! New York State Parks will be hosting more than two dozen “First Day Hikes” on New Year’s Day at Parks and Historic Sites ranging all the way from Long Island to the Thousand Islands to Western New York. This effort is a part of a nationwide initiative to connect children and families to the outdoors. To date, over 400 hikes have been scheduled across the country! Parks on Long Island, including Montauk Point State Park and Jones Beach State Park, will host beach hikes to explore marine geology as well as observe varies species of winter birds. Participants will also have the chance to observe up to four different species of wintering seals that are common near Long Island this time of year, including the grey seal, harp seal, ringed seal, and hooded seal. 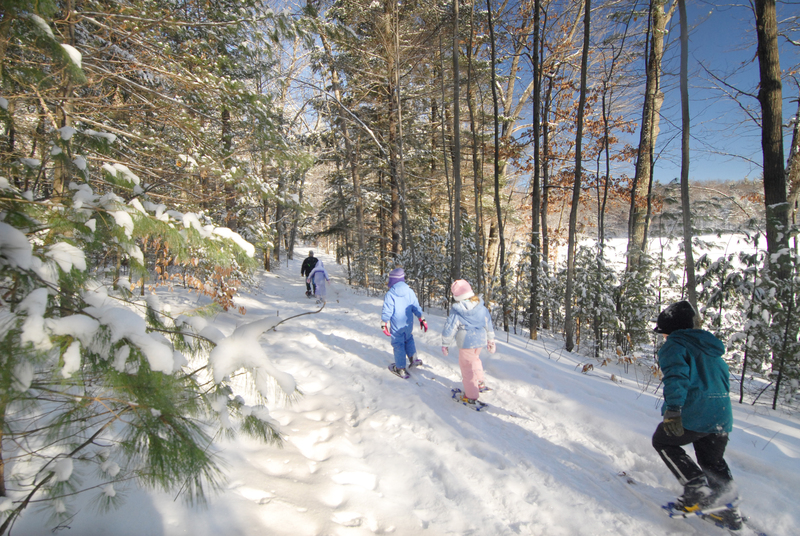 Above: Snowshoeing at Moreau Lake State Park. If you live in the Buffalo area, be sure to pay a visit to New York’s newest State Park, Buffalo Harbor! This “First Day Hike” will feature a 2-mile route along the Gallagher Beach Bike Path, with views of the historic waterfront, towering grain elevators, shipping ports, and the Buffalo River Lighthouse. Participants are encouraged to bring cross-country skis if there is snow on the ground. No matter which hike you choose, “First Day” hikers can expect to be surrounded by the tranquil beauty of our State Parks in wintertime, with views and lookout points unimpeded by dense foliage. Hikers are advised to dress in warm layers, bring appropriate footwear or snowshoes/skis and water for your group. Most hikes range from one to three miles in length. Click here for a complete listing of “First Day Hike” events and registration instructions. Post by Megan Phillips. Photo by John Rozell.